Here's an advert hyping ABC's Fall 1983 SATURDAY MORNING KID-VID schedule. It's pretty underwhelming stuff, bookended by two outings of SCOOBY DOO (unfortunately partnered by the loathsome Scrappy). 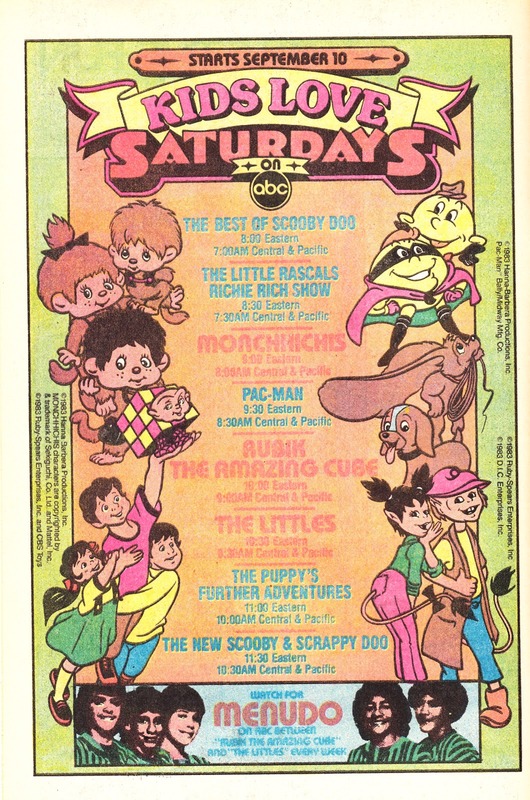 Several of these shows crossed the Atlantic: PAC-MAN was part of TV-am's early-morning schedules whilst THE PUPPY'S NEW ADVENTURES aired in the BBC. The ad appeared in Marvel Comics.